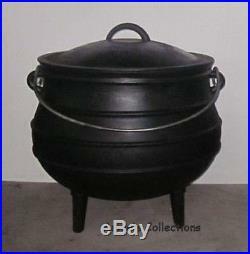 Size 3 Potjie Pot Cauldron. Cook over any fire with the simple, graceful iron technology your ancient ancestors employed when you use this magnificent foundry-cast potjie cauldron. The pure iron body consists of a three-legged round potbelly ribbed with raised lines and the handled lid fits perfectly into the wide mouth. 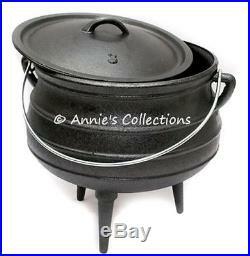 Potjie pots are newly manufactured and coated with a baked on vegetable oil to preserve the cast iron. Seasoning these cooking pots in the old fashioned way with a good shortening or vegetable oil will blacken them naturally over time and with use. This will also make the pot stronger and more elastic (yes, cast iron, can become brittle), resulting in a more beautiful pot like cast iron form the old days. Potjie Pots are made in many sizes from small herb pots to large cook kettles. Pots include well-fitted lids and heavy duty carrying handles. The round shape allows the heat to flow evenly around the sides and maintain liquids at the lowest point to keep food from burning. With a lid that has a deep lip for holding hot coals providing top heat. Used world-wide for Cajun stews, jambalayas, paellas, sea foods, Fish Fries, Beans, Turkeys, Roasts and anything you can cook over an outdoor fire. Excellent for cooking over open fires or LP gas burners. A potjie (pronounced poikey) is a time-tested form of cooking pot that has been used throughout Europe and Africa since at least the 1600s, and possibly as far back as the Iron Age. Their design exemplifies the unsung mechanical genius of ancient crafters: the deep, round bottom ensures a good rolling boil that cooks well and prevents food from sticking, while the three legs provide maximal stability, and the wide-mouthed shape allows versatility in outdoor cooking. Each potjie pot is equipped with a sturdy handle for lifting and a well-fitted lid. Cook in your potjie over an open fire or a gas burner, or pile hot coals on the deep, commodious lid to make an efficient Dutch oven. Quality Cast iron seems to be expensive but anyone who has used it. Knows the value, how it will last for generations. Is very heavy and almost indestructible. Tracking will be posted as soon a. What size potjie do I need? Potjie pots and Potjie flats both use the same numbering/sizing systems but both have different capacities/volumes. Both are close but not the same. By using this formula you will have an idea on the size best suited for your needs. If in doubt go up one size, its always better to have more room than not enough. Using 10-14 ounces of meat per person. You determine the amount of meat by multiplying the total number of guests (without Side Dishes) by 10/14 ounces of meat. This formula will help to ensure that all of your guests will have more than enough to eat, with or without Side Dishes. If you are going to use a No. 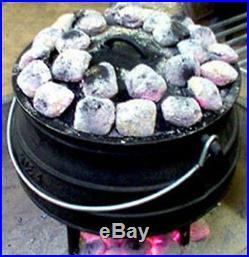 3 Potjie (6 persons), you multiply 6 x 10 ounce = ±3.75 pounds and round to 4 pounds of meat. If you use a No. 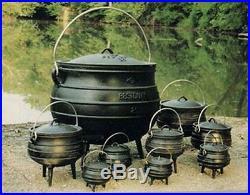 8 Potjie, for 15 persons, you multiply 15 x 10 grams = approx. 9.375 pounds rounded to 9.5 pounds of meat. All images and descriptions are the property of Annie's Collections and are not to be used/reproduced in part or whole without written permission. The item "Cast Iron Potjie Pot Sz 3 Cauldron Survival Gypsy Kettle" is in sale since Wednesday, August 02, 2017. This item is in the category "Collectibles\Kitchen & Home\Kitchenware\Cookware\Cast Iron". The seller is "anniescollections2012" and is located in Sugarcreek, Ohio. This item can be shipped to United States, Canada.